I wish to thank the Perak Academy for giving me this privilege to address you at a time when the State of Perak is at its defining moment to claim its right to constitutional democracy. Malaysians who are committed to making constitutional democracy an indivisible part of our political culture are watching your unfinished journey. The Perak constitutional crisis tells us that democracy is not a ready-made formula or a predestined political system which will fall automatically out of a written constitution. It must be written in the hearts of citizens, promoted by their understanding of it, and safeguarded by their commitment to defend it. That is the forewarning provided by the Perak constitutional crisis. Our challenge is now the future of democracy in Malaysia. Over the last decades we have seen a decline in public morality and democratic values. We have been sleepwalking through a general economic prosperity while our public and democratic values have declined. We have let the crass pursuit of the symbols of development blind us to real losses in the institutional foundations of our country. Ethnic interest, corruption and money as a means of maintaining power make a very dangerous mix. This combination poses a threat more dangerous than any other form of subversion to our nation's cohesion. Recent history, from Bosnia to Sri Lanka, are examples of what can happen if we politicise ethnicity above national cohesion. The more each ethnic group tries to maximise its own benefit, the wider we are separated, the greater is the tension. The question we all need to seriously ask as we contemplate the future of democracy in our country is whether there can be a future for democracy if we maintain the politicisation of ethnicity as we have done in the past. This is not to say that as a result of our history and of colonial political economy, that we do not have serious imbalances in our economy that can cause ethnic tension. The economic division along ethnic lines, the income gaps, the lack of confidence in entrepreneurship, and an unequal sense of well-being and empowerment are partial consequences of our political and economic history. However, these problems, perceived or factual, cannot be solved by applying policies in a way that further ethnicises our political economy. I believe the causes and consequences of these economic imbalances must be addressed and legislation can and should be introduced to eliminate unfair trade practices without politicising ethnicity. Trade with buyers and suppliers from around the world on Alibaba.com! We were inspired by the conviction that out of our diversity we would have the flowering of the Malaysian genius. The same political parties but a different leadership were in power then. Those that succeeded them, for whatever reasons, appear to have lost sight of this pledge to the peoples of Malaysia. Meaningful debate in political parties, Parliament, and the media shrank while the moral authority of the democratic process declined. We saw reversals to democracy such as the widening of the Official Secrets Act and the Printing and Publications Act. The public values that underpin the rule of law were replaced by authoritarian rule by law. Democratic means of challenging this legislation were closed off as we began to lose the separation of powers, and we lost the freedom of the press envisaged in Article 10 of the Constitution. A free press and an independent judiciary are necessary elements of a healthy democracy. Power over the party, Parliament, the judiciary, the civil service, the financial institutions and the media became concentrated in the hands of the Prime Minister. We must be worried that a generation after these words were spoken in Parliament we have not put a stop to the politicisation of ethnicity. It is now an institutionalised part of our political culture, and there are those who think, contrary to the spirit of the Rukun Negara, that it should be permanent. We shall never attain true cohesion, our constitutional democracy shall not attain its full flower, and will continue to fail to attain our economic potential, so long as we cling to an ethnicised politics. We need a new politics. We must stop the politicisation of ethnic differences that makes us forget our shared past, present and future. We need national unity based on a new politics. I do not mean unity under the dominance of one party or subservience to any group class or caste, but unity that each Malaysian can stand up and own, promote and defend. Our unity must be based on a national ethos strong and open enough to support unity and genuine democratic process. This can only be based on universal principles. I am not proposing anything new. We need a rebirth of the ideals of the Rukun Negara. However at this stage in our history the very thing that stands in the way of that rebirth is our system of political parties. It is clear that our entire system of political parties has had its day. Weak and tainted leadership on all sides is but a symptom of a system-wide failure. The parties have become increasingly irrelevant to our young and vibrant population. Much as some of us would just like to forget about these tired parties and carry on with our lives, however, we cannot leave them to their own devices. We are in our present troubles because of a failure of our parties, and reform must begin with those parties. Constitutional democracy relies on a healthy system of political parties alongside independent courts and free newspapers. We cannot build an advanced economy and a prosperous society on a swamp of morally and intellectually bankrupt political parties. 1. All political parties are required to include in their constitutional objectives the equality of citizenship as provided for in the Federal Constitution. 2. An economic and political policy that political parties propagate must not discriminate against any citizen. 3. All parties shall include and uphold constitutional democracy and the separation of powers as a fundamental principle. 4. It shall be the duty of all political parties to adhere to the objectives of public service and refrain from involvement in business, and ensure the separation of business from political parties. 5. It shall be the duty of all political parties to ensure and respect the independence of the judiciary and the judicial process. 6. All parties shall ensure that the party election system will adhere to the highest standards of conduct, and also ensure that the elections are free of corrupt practices. Legislation should be considered to provide funding of political parties. 7. It shall be the duty of all parties to ensure that all political dialogues and statements will not create racial or religious animosity. 8. All parties undertake not to use racial and communal agitation as political policies. 9. To remove and eradicate all barriers that hinder national unity and Malaysian identity. 10. To uphold the federal and state constitutions and their democratic intent and spirit, the rule of law, and the fundamental liberties as enshrined in Part II of the Malaysian Constitution and the Universal Declaration of Human Rights. 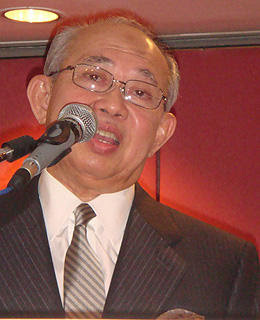 Tengku Razaleigh Hamzah delivered this speech at the Perak Academy in Ipoh last Friday (Oct 2nd).